Sarah Please Note: Whilst every care is taken in checking promoted links, we cannot accept responsibility for your use of third party web links. 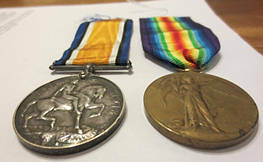 Amy’s British War Medal and Victory Medal. In 1901 Amy was working as a ‘Hospital Nurse’ at the General Hospital Nottingham, although she was recorded on the census among patients, kitchen staff and porters, rather than as is sometimes found in a nurses home; perhaps she was actually on duty when the census was written.4 By 1911 Amy is working as a self-employed sick nurse and living at 22 Down Street Piccadilly, London. It is not definite which person was her patient, however the householder is William Foy, a 75 year old widower, who does not sign the census return; his 42 year old widowed daughter Mabel signs the return, suggesting perhaps that he is unwell.5 Mr Foy also has two daughters; one widowed and one married staying with him, and Amy is one of two nurses employed in the house. It is likely that one sick nurse was for day duty and the other night duty suggesting someone was very unwell, requiring a high level of nursing care. Amy’s British Red Cross card records that she was living at 64 Queen Alexandra Mansions, Hastings Street, Cartwright Gardens, London, when she joined up aged 39 on 16th October 1914 as a Sister.6 It states that she had already served at a French Hospital in Dinard. 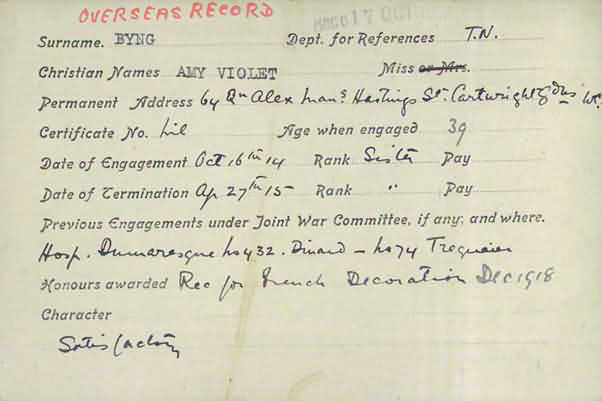 The service card states that she served until 27th April 1915, however she appears to have continued working in France, as she was recommended for a French Decoration in December 1918. In 1914 at the outbreak of war many trained nurses in Britain were turned down by the Army Medical Services when the nurses volunteered for duty abroad; Amy’s age would have made her ineligible for a post in the Queen Alexandra’s Imperial Nursing Service, which required applicants to be ‘….Between twenty-five and thirty-five years of age…’ and ‘…Were ladies of good social standing.’3 It was not until 1915 that the Army acknowledged the need, and started accepting more trained nurses. Consequentially many trained nurses like Amy, and Lucy Cox (see http://www.schoolsofnursing.co.uk/Collections1/Collections37.htm) joined voluntary organizations such as the British and French Red Cross in order to serve as nurses. Initially many nurses were also not deemed to have a suitable social status to join the Army Nursing Service. Amy’s medal is engraved with her name and the initials ‘B.R.C.S. & St. J. J.’ Her French decoration is absent. 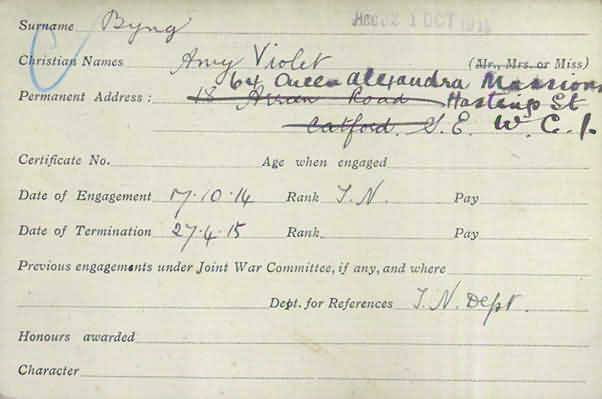 There are two medal cards on ancestry.co.uk for an Amy Violet Byng, the second one has dates as January 1915 to December 1915, for her medal entitlement; at this point she is working for the British committee of the French Red Cross, as a nurse.7 Many British trained nurses were accepted readily by European countries such as Belgium, to augment their largely untrained nursing establishment at the outbreak of war. For seventeen years between 1921 until 1949, Amy lived in Queen Alexandra Mansions, and later in St Pancras and then Holborn.8 Amy died in the French Hospital, Holborn, London in 1950, probate was granted to a private secretary; without her will it is not known if any of her descendants were mentioned.9 So far it has not been possible to trace any living descendants of her siblings. NB. It is thought that Amy trained in Nottingham; until the GNC records are searched it is not possible to state whether or not she registered as a nurse in 1922. 1. WWW.freebmd.co.uk, accessed 22nd November 2014. 3. http://www.westernfrontassociation.com/great-war-on-land/casualties-medcal/1140-british-military-nurses-and-the-great-war-a-guide-to-the-services.html, accessed 3rd January 2015. 5. TNA, 1911 England Wales Census, RG14/421, accessed via www.ancestry.co.uk on 23rd November 2014. 6. http://www.redcross.org.uk/About-us/Who-we-are/History-and-origin/First-World-War, accessed 23rd November 2014. 8. England, Electoral Registers, 1832-1965, accessed on 24th November 2014 via ancestry.co.uk. Many thanks to the British Red Cross Society. Copyright, Sarah Rogers 4th January 2014.